Today, roast chicken guru Jonathan Waxman of New York City's Barbuto and Top Chef Masters fame stopped by F&W’s Facebook page to chat with fans about kale salads, Labor Day grilling and his insider roasting tips. Here, he reveals the dos and don'ts of cooking chicken perfectly and his favorite places to eat it in America. What’s the most common mistake people make when roasting chicken? Not basting! Basting is the key. I baste with the pan juices—typically good olive oil and butter. Use a big spoon and gloves. If a whole roasted chicken comes out rubbery, what was the problem and how should it be correctly cooked? The chicken was too young and well, not a good bird. Buy the biggest bird (4 pounds) and let it sit in the fridge for a day. Then remove it from the bag, wash under hot water to get rid of the bag stuff, dry and preheat the oven to 400 degrees for an hour. Then coat the chicken with olive oil and salt and pepper. Roast it for 50 minutes, basting every five minutes. Let it rest for 30 minutes after it cooks. What are some great uses for leftover roast chicken? Hash, ravioli, tacos or eat it cold from the fridge with a beer. 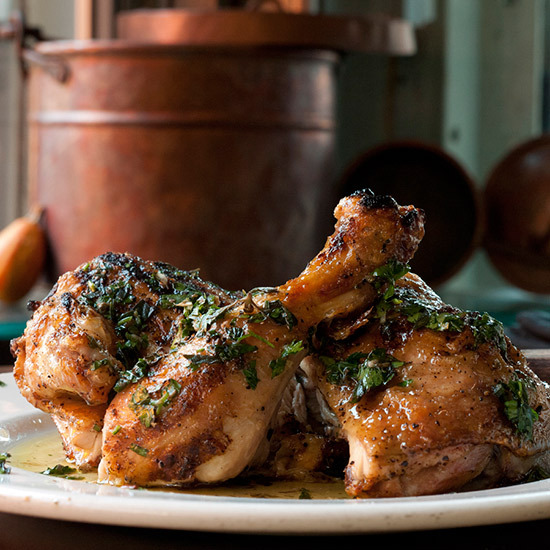 How many roasted chickens do you serve at Barbuto each week? Aside from your own, what are your favorite chicken dishes in the country? The chicken sandwich at Son of a Gun in L.A. is to die for! Chicken wings at Jonathan Sawyer’s Noodle Cat in Cleveland are scrumptious! There was a recent NPR article saying people shouldn’t wash chickens before cooking. What do you think? Wash that scum off the bird—plastic bags and chickens are not good soul mates. Related: The Best Chicken Dishes in the U.S.